Just Hanging. How About You? Welcome to October! This month’s stitches come from stuff just hanging around my house. Today’s stitch is from an adorable 3D Christmas ornament I did forever ago. To the best of my recollection, the stitched sample uses Silk & Ivory (black lines) and Shimmer Ribbon (aqua lines). I like the additional stitch element of the smaller diagonal scotch element (over 2-3-2) in between the larger squares. I think it adds more interest to the overall stitch. As I created this diagram, I kept thinking this is a large space stitch. (And it is.) However, ornaments are generally small and this stitch worked perfectly. The lesson is to always have an open mind regarding stitch size. Don’t be afraid to use smaller stitches in larger spaces and vice versa. Clearly, I like this stitch for clothing. Other cute thread combos would be silk floss and Kreinik Metallic for a lighter touch. For more dramatic clothing, consider Very Velvet and Fyre Werks. It would make an intriguing architectural element, such as a pathway or tile floor, with a silk perle (black lines) and an overdyed wool (aqua lines). Today's stitch is a variation on another favorite stitch. It's a great pop of colors and finishes that can help bring a small space to life. I. Love. This. Stitch. The stitched sample is me playing with Vineyard Silk and Kreinik Metallics 1/16" Ribbon on 13-mesh. There are so many applications for this stitch. I integrated this stitch into a student's project with Lorikeet for a small bush, replacing the single tent stitches with French Knots. It would make a darling sweater or small Christmas stocking, especially with two colors and/or two different finishes. The stitched sample is a perfect example of that. Consider leaving the two tent stitches out for an open stitch for any sort of small greenery or even water. As much as I love open stitches, they require balance. A balanced project includes open stitches with varying degrees of coverage and a handful of full coverage stitches. Today's stitch is just that perfect full coverage stitch. This stitched sample is the background from last week's post, using DMC Perle #8 and Flair on 13-mesh. I selected the lighter weight threads because I didn't want to ignore the brown spots in the background, but I also didn't want to draw attention to them. Sure, heavier threads would have covered the brown spots, but I wanted it all, as it were. I think this strikes the perfect balance. I love how understated this stitch is. It would work well for clothing (with Very Velvet for the gray lines and Fyre Werks for the turquoise lines), calm water (with lightweight Kreinik for the gray lines and Petite Silk Lame for the turquoise lines), or even greenery (with Bella Lusso Merino Wool for the gray lines and Lorikeet for the turquoise lines). 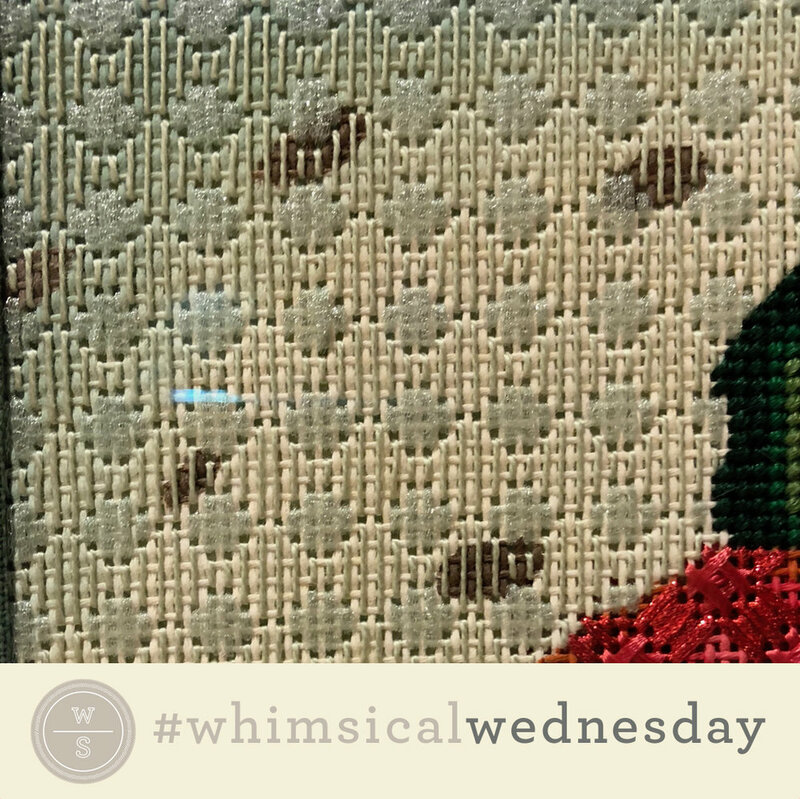 I introduced you to this stitch in one of the first #whimsicalwednesday posts to illustrate open stitches. Today's stitch uses a different set of threads and the stitch pops in a completely new way. The addition of multiple colorful accents, including Cross Stitches and Smyrna Crosses, turns this stitch into something quite spectacular. The stitched sample uses Silk & Ivory, Frosty Rays, and Kreinik Metallics Medium Braid (#16). The heavier thread weights provide more coverage and more focus on the stitch than the shading underneath (unlike the original post). If you like what you see on this blog, want to learn some very creative decorative stitches, and how to put them all together, whimsicalstitch.com sells stitch guides and stitch concepts for Melissa Shirley Designs, Zecca Designs, and Patience Brewster. 45 guides are currently available and more are in the pipeline. 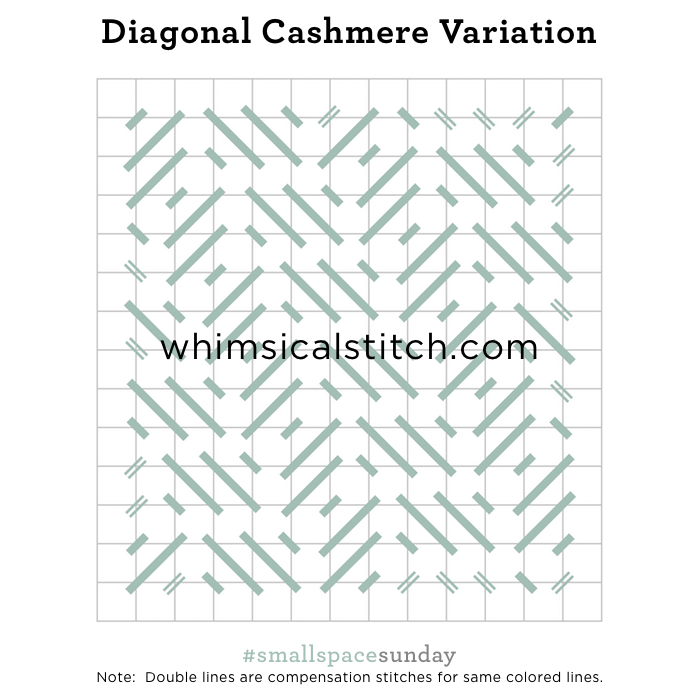 Today's #smallspacesunday combines of a wide variety of cashmere stitches...horizontal, vertical, and diagonal. It's quite interesting but you have to pay attention as the alternating directions are not the same pattern. One includes a full cashmere and the other is a diagonal cashmere.. The stitched sample uses four plies of DMC Floss on 18 mesh for a roof on a Melissa Shirley Halloween building. It would work really well as a floor, greenery, grass, or tabletop. Consider stitching one of the Cashmere columns in a second contrasting thread, whether that is color or finish. If I had to do this roof over again, I would add a complementary metallic thread. If you like what you see on this blog, want to learn some very creative decorative stitches, and how to put them all together, whimsicalstitch.com sells stitch guides and stitch concepts for Melissa Shirley Designs, Zecca Designs, and Patience Brewster. 44 guides are currently available and more are in the pipeline. Your eyes are not deceiving you. 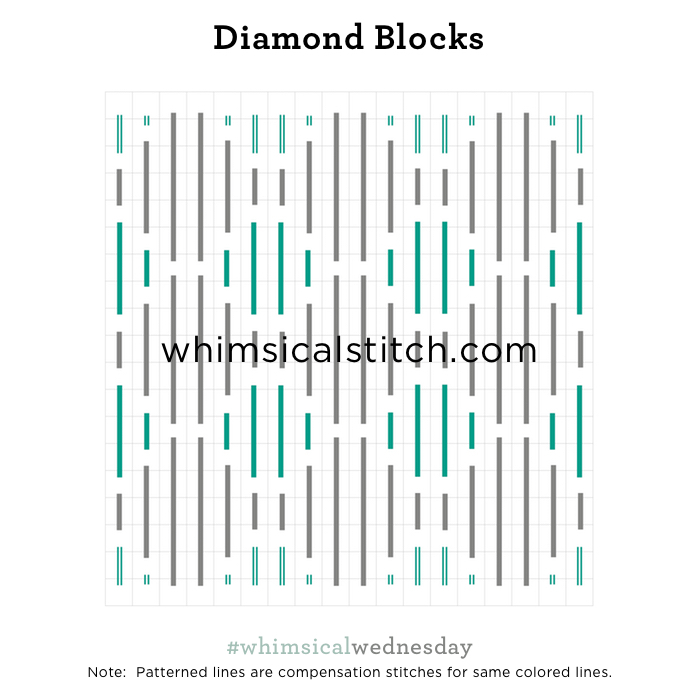 Today's stitch is a traditional diagonal stitch. I like the size of this stitch and, more importantly, it added the necessary movement to the object on the canvas . It's a simple pattern. A group of three stitches over two rows, followed by a group of four stitches over three rows (centered against the adjacent group), and repeat. I chose this stitch for the body of a horse to add dimension and direction to the body as well as make it smooth (hence the larger stitches). For an animal body, I recommend any good wool. We used Rainbow Gallery Persian Wool for the project above. Vineyard Merino Wool would be a great choice, as well as Bella Lusso or Burmilana. Today's stitched sample is me playing with two plies of Floche on 18-mesh. The only thing missing is a Pina Colada.